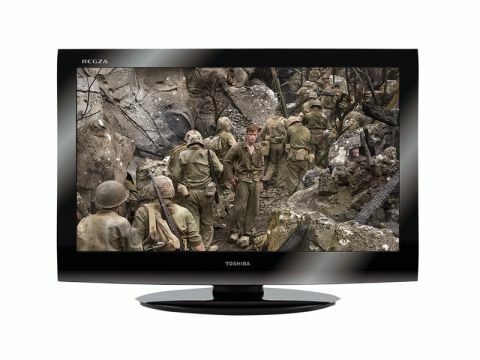 Toshiba's 40LV713DB is one of the cheapest 40-inch LCD TVs around. So we guess we'd better brace ourselves for a few compromises. These start, to some extent, with the set's looks. The chunky, rather plasticky bodywork looks a little old fashioned. The set's connections, aren't quite as extensive as we might have liked, either. There are three, rather than four HDMIs and no Ethernet port. As well as denying DLNA PC or online access, this means the tuner isn't a Freeview HD one. There is some multimedia connectivity, in the shape of a D-Sub PC jack and a USB port able to play JPEGs and MP3s. The screen has a full HD resolution and carries Toshiba's Active Vision video processing system. It also boasts more features than we'd expect of a £600 TV. Among the highlights are an adjustable Colour Transient Improvement tool; an 'Adaptive Luma Control' mode that optimises contrast and brightness based on image content and a genuine colour management system. Considering how remarkably cheap it is, the 40LV713DB's pictures aren't too bad at all. They're much brighter and more colour rich than those of last year's equivalent model, immediately making them less obviously 'budget-standard'. Black levels are also greatly improved. There's considerably less greyness hanging over dark scenes, and the backlight is excellently uniform across the screen. Add these black levels to the enriched colours and greater brightness, and you've got a picture that looks both dynamic and, with Blu-rays, quite cinematic. Finally in the plus column, despite not carrying Resolution+, the 40LV713DB makes a decent fi st of upscaling standard-def material. And so to the inevitable budget TV brickbats. First, colours don't always look entirely natural using the provided presets. But time spent with the colour management tools can largely solve this. You pay a small price for the good black level response, meanwhile, in the shape of a slight lack of shadow detail. Talking of detail, high-definition pictures aren't quite as crisp as they could be – partly because there's slight resolution loss over moving objects, and some momentary trailing behind fast motion. Finally, contrasty edges can look slightly stressy – especially with standard-definition material. Overall though, pictures are far better than they have any right to be, considering the price. Shame the same can't be said of the set's audio. Its speakers are severely underpowered, sounding muted, muddy and compressed whenever they're pushed even remotely hard.